Matt Heron gets in a header for the Peterborough League XI during their 4-3 defeat by the Dorset Premier League in the FA Inter-League Cup tie. 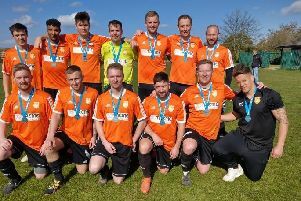 Riverside recorded their first win of the season in the ChromaSport & Trophies Peterborough League on Saturday (September 19) to move off the bottom of the Premier Division table. They won 5-3 at Uppingham Town thanks to a Thomas Lancaster hat-trick and single strikes by Geres Gil Matos and Ian King. Thorney meanwhile suffered their first defeat of the season when losing 2-0 at home to Ketton. Alex Brockbank and Matthew Woodman were on target for Ketton, who bounced back well from a 9-0 thrashing by Deeping Rangeres Reserves the previous weekend. Tony Edwards scored his eighth goal of the season in Pinchbeck United’s 1-0 win at Leverington. The Langtoft v Crowland fixture was called off because Crowland were unable to raise a side.